Heads up all of you who dream of becoming a top stylist, our fashion girl is coming to your fancy makeover salon to get a beauty treatment and become a super star! Give your star doll a virtual hair makeover, cleanse her face and give her a complete facial spa treatment! Prove you're a real makeup genius and apply professional makeup! 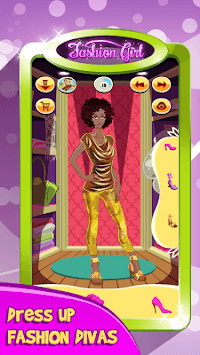 Be a fashion designer and dress up models in the trendiest outfits! ✾ Facial beauty salon room – wash your face, put a face mask on, get rid of pimples and put an expensive face cream on - pamper yourself in our princess beauty salon! ✾ Dress up room- be a stylish fashion diva and choose the best fashion women's clothes in our latest fashion game! Fashion beauty game for you to create the most beautiful styling for you fashion show! ❀ Cleanse your model's face, remove pimples and apply creams to make her skin soft! So, what about a good dress up girls game? We know girls love fashion clothes and accessories, so don't worry – a closet full of fashionable clothes for girls is waiting for you! Dress in latest fashion evening dresses, and put together a beautiful styling with our fashion accessories! 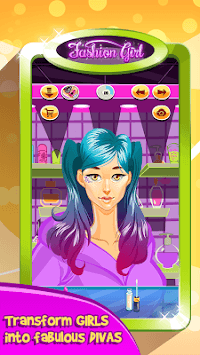 Don't hesitate any longer – one of the best hairdressing and make up games is here! Download our free virtual makeover game *Fashion Girl: Makeover Salon* and visit our celebrity make up salon, face care salon, hairdresser and “fashion dress up games”!